When a client purchases a Premium Listing, and again upon renewal, the listing appears near the top of the directories for the areas of expertise the client has chosen for his/her listing. The listing is then replaced in this position by new subscriptions and renewals. However, the first position and second position in a directory may be reserved by clients who wish to post their Premium Listing in that top spot for their main area(s) of expertise. See our step by step online ordering guide for easy instructions on how to subscribe to the Top of Directory position. How to Be at the Top of a Directory? You can post your Premium Listing in the first position of a directory for your main area(s) of expertise. This feature will maintain your Premium Listing at the top of a directory for a full year regardless of new subscriptions and renewals. If the first position is not available, you can post your Premium Listing in the second position of a directory for your main area(s) of expertise. Being at the Top of the Directory for your main area(s) of expertise will help your company be seen first by attorneys and other legal representatives. 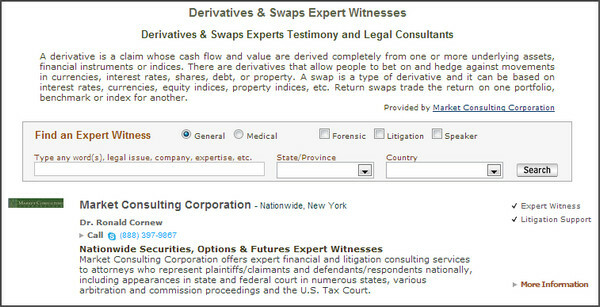 Example of a Top of the Directory position for Derivatives & Swaps, sponsored by Market Consulting Corporation. Where Does the Top of the Directory Position Appear? Please note that the Top of Directory positions are not valid for the search results obtained from the HGExperts.com search module. When a person is typing keywords in the HGExperts.com search module, the Top of the Directory positions might not come up. The top position is only guaranteed to appear on the expertise directories. As you can see, the URL includes the name of the area of expertise. 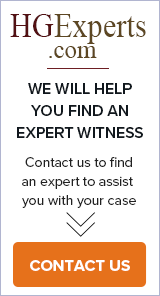 In this case, the expert witness who purchased the top listing will appear on the directory in the first position for 12 months, at a cost of only $200. You will notice that the URL ends up with "search" and that there is no mention of the area of expertise. In the case of a search using the module, the firm who purchased the top listing might NOT appear at the top of the search results. The reason being that the visitor might type keywords involving different areas of practice or location (Example: computer failure crime California) instead of the exact wording for the description of the expertise. However, if the visitor simply clicks on the link to a specific area of expertise instead, the firm who purchased top listing for that expertise directory WILL APPEAR IN TOP POSITION. What Does the Top of the Directory Position Include? Your Premium Listing will appear for a full year at the Top of the Directory when purchased the same time as your listing. When purchased at a later time in your subscription, your Top of Directory will be pro-rated to your expiration date. We invite you to write an introduction briefly describing your area of expertise (60-80 words maximum*). Your text is posted above the search module of the sponsored directory. This is available only for the first position, not for the second position. We add a link to your Premium Listing under your introduction (Example of an introduction and a link for Expert Communications). If your area of expertise is not listed in our database, we will add it. *Please note, if your intro is too long, HG.org will ask you to edit the intro. If you do not complete the requested edit, HG.org reserves the right to edit the information to conform to our maximum length requirement. The pricing for a Top of the Directory Position or Second Position is only $200/year per area of expertise, in addition to an active Premium Listing subscription. If you do not purchase a Top of Directory Position at the same time that you buy or renew your Premium subscription, the price will be pro-rated to your listing expiration date. Ordering is as easy as 1-2-3! For complete step by step instructions, see How to Order Top of Directory and you are one step closer to maximizing your Premium Listing.